The day has finally come. This is the day we all have been waiting for the past few months, and it’s here. Microsoft has started rolling out the final version (RTM) of Windows 10 in waves to users who have registered for the free upgrade. By now, many of you probably have upgraded your Windows 7 or Windows 8.1 installation to Windows 10 for free and now looking for a clean install of Windows 10. To help all users who have upgraded from Windows 7 and Windows 8/8.1 to Windows 10, Microsoft has just released Windows 10 Media Creation Tool to allow users download Windows 10 ISO directly from Microsoft, without having to enter the Windows 10 Product Key. 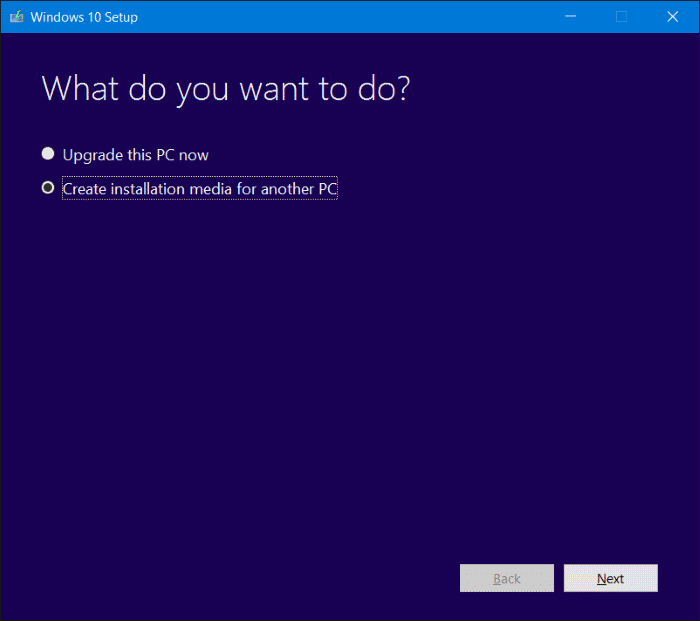 Besides allowing you to download Windows 10 ISO from Microsoft without the product key, the Media Creation Tool also allows you upgrade your current installation to Windows 10. 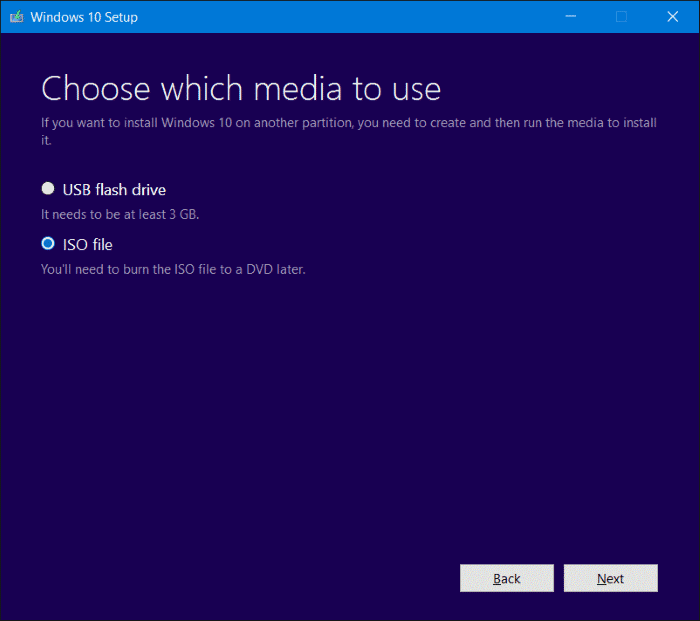 Luckily, the Media Creation Tool can also be used to download Windows 10 ISO file for another PC as well, which means if you have a PC without an internet connection, Media Creation Tool can be used to download Windows 10 ISO for that PC as well. Important: Starting November 2015, there is no option in Media Creation Tool to download Home and Pro ISO images separately. You just need to select Windows 10 in Edition field. This ISO includes both Home and Pro ISO images. If you want to install only the Pro edition, please refer to our how to select Pro edition while installing Windows 10 guide for detailed instructions. After downloading the Windows 10 ISO file, you can use the same Media Creation Tool to create bootable DVD or bootable USB of Windows 10. 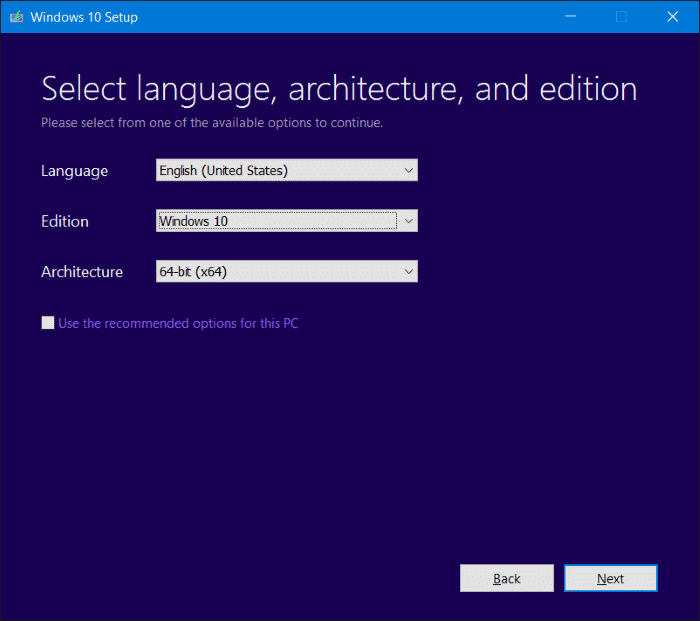 More importantly, while installing Windows 10, you will not need to enter a product key to activate your copy of Windows 10 if you have previously upgraded from Windows 7 or Windows 8.1 to Windows 10 on the same PC. Unlike before, there is no separate Media Creation Tool for 64-bit. Microsoft has now included both 64-bit and 32-bit in a single installer, meaning the tool that you download from the below link is compatible with both 32-bit and 64-bit Windows. There are two versions of Media Creation Tool for Windows 10. One is for 32-bit version of Windows, and another is for 64-bit Windows. So be sure to download the right version of Media Creation Tool for Windows 10 from the download page (link available at the end of this article). As you would expect, you need to run the Media Creation tool for Windows 10 with admin rights. Have fun with Windows 10! I’m in need of a good writing app, specifically for Windows. Any suggestion? I have the iso file…. but how do I unpack it and run it on my computer for the update version of win10? This is Perfect!!! As of today 20170919 I was able to create installation disk (Windows 10) without key to be able to install it at a later time. All in one package for 32 bit and 64 bit with option to select N Edition as well. I have downloded and xecuted the tool getting the installation media on a USBflash drive. Now i’ll wish to know in detail what have to do in order to get a complete image of my actual system (WIN10 and other programs I use) on a USB external drive to be used for restore the backup in case of a system crash. I saved both the 32 and 64 bit Windows 10 update to a flash drive. Can I use this on any PC I want to after the free download period is over? I have 2 computers, Win10 64 bit Pro desktop, and a Win10 32 bit home Laptop. The laptop has been upgraded to version 10586 and the desktop seems to be waiting for the 64bit Win pro version of 10586. It’s April 11, 2016 and I have been reading about a new version coming out in July of 2016. Should I just wait for the new version in July or would it be better for me to try to run the Media Creation tool and upgrade my desktop to 10586. I am not having any problems with my computers right now. The download page brings me to the ISO download page. Where can i get the media creation tool? Thanks for the comment. Microsoft is no longer providing separate Media Creation Tool installer for 64-bit. I have updated the article. Thanks again. Hi, I just stared the install using the creation tool. Unfortunately, there was only one on the MS page. I didn’t see links for 64bit. Please, provide exact links or update your article. I started using the tool…because it is the only one on the page that you linked, but I NEED 64 bit. Hopefully, my computer will still function correctly… I don’t know if I can quit the media creation application. Please, HELP.